Carbiderods in fixed lengths to customer specifications. We cut our solid carbide rods for you. Chamfering of solid carbide fixed lengths. 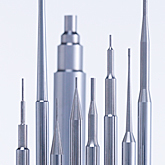 Any other type of chamfering or cylindrical profiling can be implemented quickly on request. Milling surfaces as per DIN 6535 / shape HB and HE. 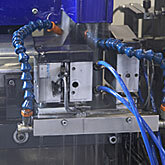 Manufacturing area: Ø 6 to Ø 32 mm. Solid carbide blanks for step drill ground on outside diameter. Individual contours precisely formed according to your specifications. Manufacturing area: Ø 3 - 40 mm.